Are you a web geek? Can a 404 error page excite you? If the former is true, it proves the latter. I’ll confess “yes” to both. Today at work I was doing some miscellaneous web-related research (aimless surfing? no, no, never), and I came across a page of creative 404 error pages that inspired me to finally do something interesting with my own 404 error message. Having lived in Atlanta (area code 404), I initially set out to do something that played off that. (I know, very original. I just wanted to make sure not to settle for “Tha 404.”) But it wasn’t long before my roadgeek tendencies kicked in and I thought of something even better. The sign image is (mostly) my own creation in Photoshop: I swiped the shield images for I-16 and Georgia 404 as SVGs from their respective Wikipedia pages, and the font is courtesy of another roadgeek. Whenever I start to question myself, I am reassured that there are others out there even sicker than I am. Incidentally, there really is a Georgia 404, although the only place you’ll see a sign for it is on a small spur route near Savannah. Georgia’s Department of Transportation has a funny little quirk in that it has given all freeway-grade roads a state highway designation in the 400 range. (I suppose the “4” indicates 4 or more lanes.) As far as I know (and as this PDF from the GDOT website seems to confirm), there’s only one road in the system for which this is the main designation, however: Georgia 400, which is a main commuter artery running north (well, northish) from Buckhead out to the north-central suburbs and beyond into Deliverance country, since both I-75 and I-85 veer off diagonally out of the city (into the northwest and northeast suburbs and beyond into Deliverance country). All of the other freeways in the state have a “4xx” designation too, but there are generally no signs indicating such, because they all also have a familiar designation, usually an Interstate number. As it happens, Georgia 404 is better known as I-16 (hence the double shields on my sign image), which, interestingly enough, is not really “interstate” even though it’s an “Interstate”; it starts in Macon and ends in Savannah. Well, this is one of those things. I’ve done a fair amount of cross-country driving, but the long-haul trip I’ve made far more than all others put together is that between Minneapolis and Chicago along I-94/90/39 through Wisconsin. 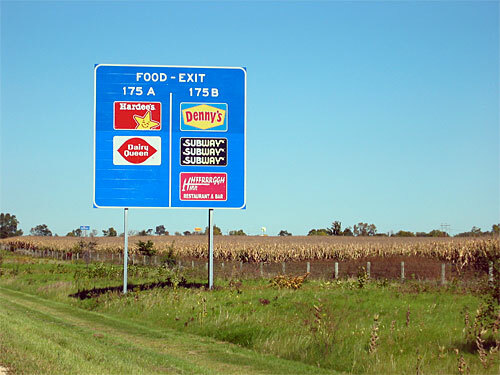 And yet, somehow, I went for years before more than a handful of brain cells bothered to notice, on one of those typical blue road signs advertising food/gas/lodging in Janesville, Wisconsin, the oddest business name I have ever encountered: Hhffrrrggh Inn. 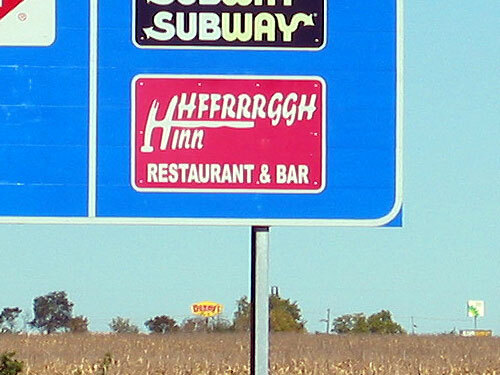 Yes, that’s right: Hhffrrrggh Inn. The name is so weird, it took about 3 or 4 trips past the sign before I even managed to make out enough of the letters to be able to take a reasonable stab at googling it. A strange thing happened to me the other day. Now your average person, even your average detail-oriented person, may have glanced at that sign and not given it a second thought. But I was immediately consumed with perplexity over the liberties taken by the sign maker with respect to the use of periods. Why, I wondered, did the first “B” warrant a period while the second did not? Or take another example: Tonight when I got home from work, I found a new MacMall catalog had arrived, and I perused it with passive interest while SLP was on the phone. I was mildly irritated to see yet another use of the annoying stock photos of perfect people in black mock turtlenecks with their arms folded atop some invisible barrier, which have become staples for use in stupid photo illustrations in these catalogs, where the perfect people are made to look as if they are leaning against a steroid-enhanced 5-foot-tall software package. You’re probably thinking that my awareness of these stock photos of perfect people in stupid poses is the focus of my detail-obsessed attention in this story, but you’re wrong. In fact, I noticed something even more stimulating to my detail obsession: On one page I saw a photo of a young woman with long blonde hair, and on the next, a distinctly different young woman with short, curly red hair. And that was when it hit me. I noticed that the hands of the two women were in exactly the same position. In fact, the arms in the picture belonged to the same person and were from one single photograph, but the heads were different. What’s more, the skin of the hands in the photo was color-corrected to match the facial complexion of the woman in each photo. Clearly, if I notice something like this on passing glance, I have a problem.